Macassar Ebony Lumber is also known as Striped Ebony. The woods heartwood is black with reddish or brown streaks. Sometimes it can be grey-brown, pale brown or yellowish brown. Also the color of the grain is usually straight and furthermore can be wavy or irregular. Macassar Ebony Wood has a fine texture, as a result giving the wood a distinctive metallic lustre. 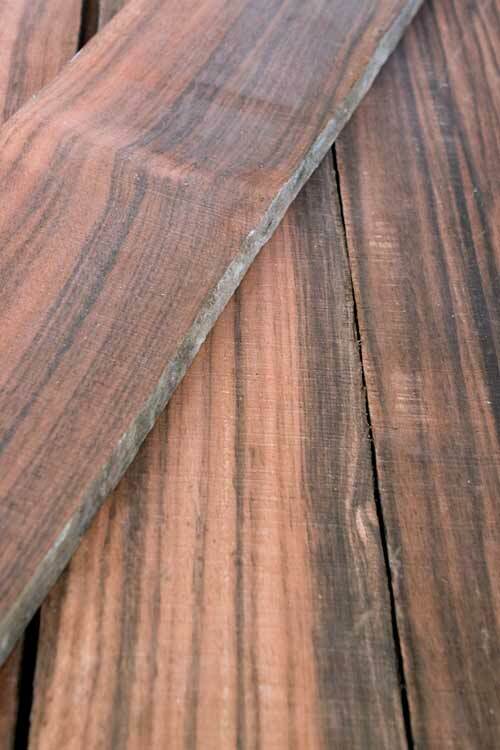 Macassar Ebony lumber is dense, hard and heavy. The principal use of Ebony is high-end cabinetry, billiard cues, musical instruments, veneers. It is also popular to make small specialty items like pens and knife handles. We stocks FAS grade Macassar Ebony Lumber that is kiln dried and comes in a rough state at 15/16 of an inch. The scientific name is “Diospyros Celebica” and weighs approximately 5.95 pounds per board foot. Currently our stock is 7 foot to 10 foot tall. This wood is expensive and most customers are looking for consistency in their buy. So we have decided to sell these boards as whole pieces. We most likely will not cut these boards into sections for small quantity orders. Please contact us for board specific images, sizes for full descriptive details. Macassar Ebony Wood is difficult to work with, due to its high density. Pre-boring is always required for nailing and screwing. Macassar Ebony Lumber has a severe blunting effect on cutting edges. Also the glueing properties of this lumber rates as satisfactory to difficult. This wood is excellent for turned objects, veneers and has the potential for a first class finish. If your interest in more of the details on how they grade lumber you read all about it in NHLA Rules Book.